When looking to add brass accents to your modern home, subtle touches make a big impact. Add brass bar stools to your kitchen island countertop for additional modern seating. Modern brass flatware can be used for everyday place settings or for special occasions that call for modern decor. This colorful Mid Century modern dining room still allows the brass chandelier to make a statement without overshadowing the colorful design elements. 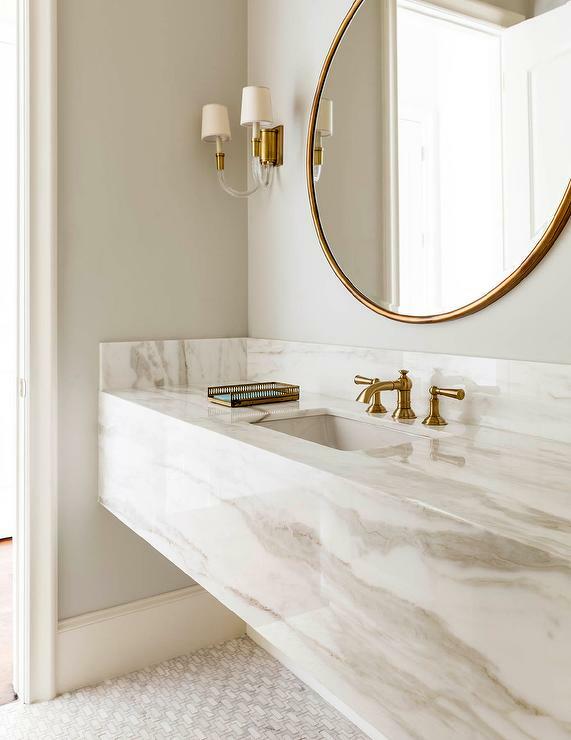 Brass in the bathroom can be subtle by only accenting with brass fixtures and a neutral color palette. A Mid Century wooden vanity with subtle brass knob accents creates a simple and inviting bathroom that is ideal for guests. An accent chair with brass legs is a modern twist on a class arm chair. Acrylic and brass make the perfect pair when looking for modern bar cart decor. Oversized mid century inspired office chairs with brass accents make a strong powerful statement. What is your favorite way to decorate with brass in your modern home? Comment and add pictures below!